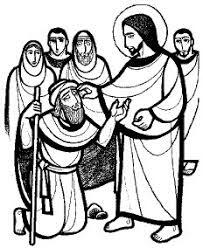 Perhaps make Bartimaeus’ cry to Jesus, all those years ago, your prayer today. Take a few minutes – in church, or at home, in the back garden or while you’re out for a walk – and simply say over and over, very slowly, the words: ‘Son of David, Jesus, have pity on me’. A blind man sees and follows the Lord. who see with eyes of faith. and to recognise the Lord in our life. May he give us joy in following him. Scripture Reading from ‘The Jerusalem Bible’ © 1966 by Darton Longman & Todd Ltd and Doubleday and Company Ltd. Prayer adapted from Bible Claret © 2016 Bibleclaret. All Rights Reserved. This listening is at the heart of his authority. It is the way Pope Francis lives out one of the titles of the Pope – the servant of the servants of God. It is sometimes hard to imagine the Pope as a servant, even Pope Francis who has done away with much of the trappings that surround the Pope – but that is what he is – a servant. That is something of what Jesus was talking about in the Gospel today. He was saying that people in authority are to be servants of His people. True authority is lived out in service and that turns the way the world thinks on its head. Jesus saw authority as a way of service, to promote the good of others rather than to promote one’s own honour and glory. This is at the very heart of all our Christian service, as we each try to imitate Jesus in our daily lives. The only way I can live out my calling to service as your Archbishop is by listening. I need to hear the hopes and fears of our people, the challenges facing our priests and deacons, our schools, and the reality our families have to deal with each day. 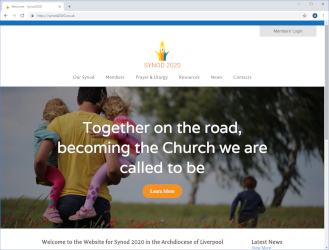 I have decided to call a Synod to help us to meet some of the pressing issues that we face at this time in the life of the Archdiocese. How are we to witness to the Gospel message of God’s love in a culture that seems to have little room for faith? How can we better organise our resources of priests, deacons, people and buildings so that we can become the Church that God is calling us to be? How can we best support the work of Catholic education so we pass on our faith to the next generation? How can our Catholic lives be better supported by the ministries of the Church? 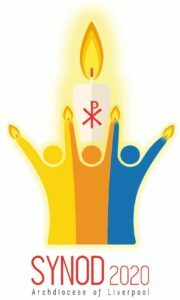 The word Synod means “Together on the Way”. The Synod is a moment when together we can choose a path to walk on, guided by the voice of the Holy Spirit who will speak to us. The Synod is not just another meeting. It is a journey. We have just had a year of prayer which reached its climax for us in the Eucharistic Congress. Over the next two years we will be trying to discover the will of God through listening and learning. The voice of each one of us needs to be heard. 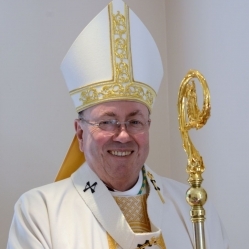 Parishes and pastoral areas will be invited to choose members for the Synod. I hope that there will be many different opportunities for all of our people to share their hopes, their fears and their dreams of the way the Holy Spirit is at work among us to bring fresh life into our Church. In October 2020 our Archdiocese, priests and people together, will meet to reflect on what we have heard and vote on specific proposals that have arisen from the discussion and sharing in our parishes and pastoral areas. I have decided to work in this way because we believe that the Holy Spirit is at work in the bishops, priests and people of the Archdiocese. So, I need each one of you to play your part in our Synod process. Without you we will not hear the call of God guiding us and walking with us on our journey. I will officially convene the Synod at a special service in the Cathedral on Sunday 3rd February next year. All five hundred members of the Synod will be present at this service. From here they will be sent out to do their work of listening, reflecting and discerning, supported by the prayers of all of us. I need your help so that we can truly be a Church that listens. We all have members of our families, neighbours and friends who are Catholics, but have little contact with our parishes. Is it possible for us to listen to their experiences and their needs so that we can be a Church that serves them too? We are going to try to listen to our young people, to families with children, to those who work in our schools. What will our Church be like for them in twenty or thirty years’ time? We want to hear the experiences of those who may have made their home in our parishes only recently and to learn how we can welcome them in a better way. In all this listening and learning let’s pray that we might hear a call from God to change, to try to be His Church in a new way. Today is also World Mission Day. We are invited to reflect on the call of God to be His missionary disciples. God’s gifts are not given to us to be hoarded but to be shared. Please keep in your prayer the work of all those who seek to share the Gospel message across the world. Today, with real enthusiasm in my heart, I invite you all to join in the journey which will enable us to become the Church that God is calling us to be. 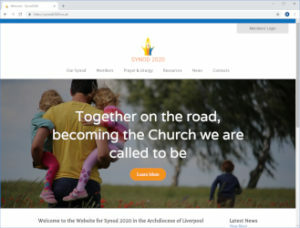 That is our Synod 2020 journey! 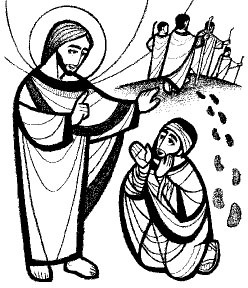 There are three sections in today’s Gospel passage: a narrative about Jesus’ encounter with a rich man, Jesus’ sayings about wealth as a possible obstacle to following him, and Jesus’ promise of reward for those who share their material possessions with the poor. Jesus reminded the rich man of the commandments that deal with relationships with other people and challenged him to sell what he had and to give the money to the poor. This shocked the disciples because it challenged the Jewish belief that material wealth and prosperity were signs of God’s blessings. Instead, Jesus declared that true religion consists in sharing our blessings with others rather than hoarding them and getting inordinately attached to them. who looks on us with love. This passage is part of the second story of creation in the first book of the Bible. Notice the beautiful image of Adam giving names to all the animals. Notice the need Adam had for another human being – a need we all have. For all married couples. 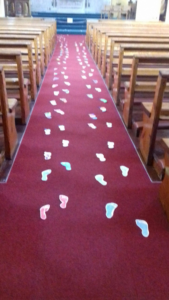 In whatever part of life’s journey they find themselves, may they have God’s loving presence at the centre of their union, to support them in good times and in bad, in sickness and in health, until the evening of life comes. For those who have known the disappointment and hurt of marriage breakdown. May they be touched by the love of God who walks each step with them, and who desires a full and happy life for them. For those who have experienced the death of their husband or wife. In the midst of their sorrow, may they also have the consolation and joy of cherished memories.